Disclaimer: I apologize for the cringy headline, but I have an obligation to come up with attention-grabbing, eye-catching headlines, and that’s literally the best I could come up with. George Orwell’s 1984 has had a profound impact on me – intellectually and emotionally. 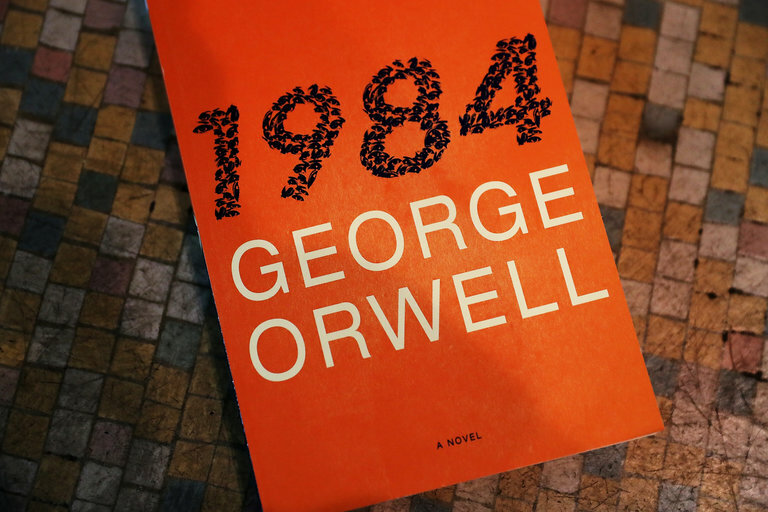 When I first read it in 8th grade, I didn’t foresee how “common man” Winston Smith would relate to my life and the Party’s totalitarian regime would influence my way of life and beliefs in communism, socialism, and democracy. I simply read the book because it was on Goodreads’ Books That Everyone Should Read At Least Once. Only after picking it up in high school again did I really scrutinize over the nitty-gritties of the poignant plot. My classmates and I also had to study it for our English Literature and Language class, so this led to more discussions, and I was completely in awe of Orwell. Having only read his memoirs in Down and Out in Paris and London, I saw a new side of Orwell. 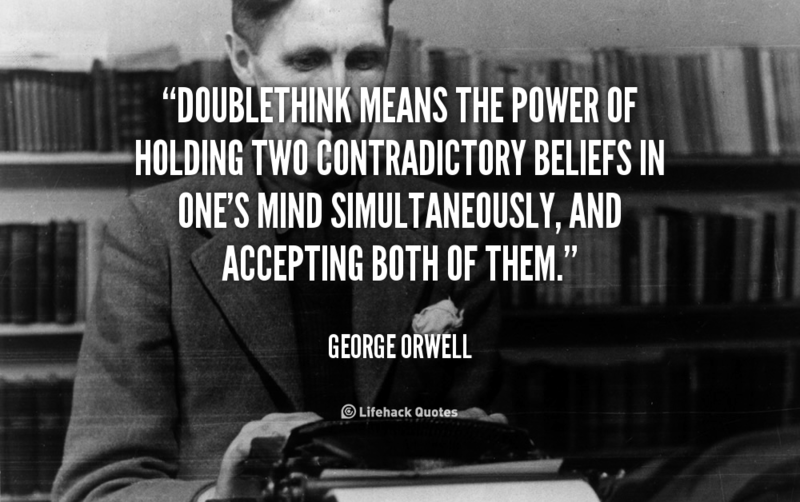 A concept that I found quite fascinating in 1984 was Doublethink. When it was first published in 1948, the idea of doublethink was so far ahead of its time that many critics argued that doublethink was psychologically implausible. I mean, even the definition is paradoxical in nature. However, what is really fascinating is that doublethink isn’t as far-fetched as psychologists believed it to be. In fact, some might even call it commonplace. So, in this post, I thought I would elaborate on some real-life examples were doublethink is employed, hence the headline Doublethink In-Real-Life. Fitting, don’t you think? Land- Land reclamation increases the land available to a country. Labour- Education and vocational training facilities help improve human capital, thus increasing productivity. Enterprise- Improving the distribution of educational opportunities and its accessibility for children will help improve the literacy rate. As more are literate and educated, they will have the tools to come up with innovative ideas and possibly start their own business venture. Capital- If there is an increase in foreign direct investment (FDI) for a country, then the country will see an increase in capital. From this, we see that economists hold two beliefs that completely contradict each other – resources are scarce, but they can be improved in quantity and quality. What is interesting is that these two beliefs are the fundamental pillars of economics. My mom often tells me that grades don’t matter, that if I get an F in one exam, it’s completely okay, cause ten years down the road, I won’t even remember it. This is true, but I know that my grade for that one exam matters for my university acceptances, and so it does influence my future. Again, I apply doublethink because I hold both beliefs that my grade for that one exam does and does not matter, but the only difference is the time period in which they matter. While in the short run, it matters a lot, in the long run, it has no bearing. in order to make the sacrifices necessary to reach world class levels of performance, an athlete has to believe that performing well means everything. They have to cleave to the belief that winning Olympic gold is of life changing significance. But it’s just that belief that is most likely to trigger a choking response. So the key psychological skill is to ditch that belief in the minutes before competition and to replace it with the belief that the race does not really matter. It is a form of psychological manipulation and it takes a lot of work. I couldn’t agree more. It saves you from delusion but keeps you contained with the capability to act. Not many can do that. Free Speech VS Hate Speech? Many promote the idea of free speech, the right to express any opinions without censorship or restraint. Simultaneously, the same people believe that hate speech should be banned, which means that speech that attacks a person or group on the basis of attributes such as race, religion, ethnic origin, sexual orientation, disability, or gender should become illegal. This one is quite self-explanatory! I often see kitschy Tumblr posts that remind me to stand out, be unique, and embrace my “inner weirdness”. However, afraid of being judged and due to societal/peer pressure, I often find that I want to fit in. One of the major goals in our lives is to earn money and make a solid income. This might be a primary or secondary goal, depending on your value systems. However, there is also the old adage “money can’t buy you happiness.” So, which is it? In 1984, doublethink seemed improbable and dubious, but now, we see that we employ it regularly. Hope this post helped. Check out my other posts on 1984 (The fact that I have so many goes to show how obsessed I am with the book): The Evolution of Language and George Orwell’s 1984. You are really gifted in analysis. I love the way you were able to draw out the concept of double think from some basic principles in Economics. I initially didn’t see them that way. It was eye opening! Thank you! Hope the post was informative! Previous Previous post: Does Dark Matter exist? Next Next post: Nostalgia: Why do we need it?